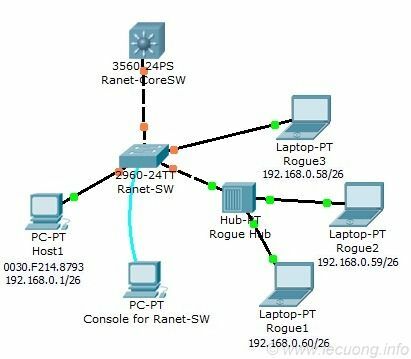 You are the network administrator at Ranet,and would like to enable Port-Security on the access ports of Ranet-SW to prevent the use of another switch connected that let multiple hosts connect through the same port at the same time, and to prevent the unauthorized host connect via some port. 1. Enable Port-Security on all access ports (except Gig1/1, Gig1/2), and set parameter to allow only 1 MAC Address per port and the action when violation happened is shutdown port. 2. On port Fa0/1, now there is the authorized host connected (Host1), set the allow MAC Address on this port by “SecureSticky” method. 3. On port Fa0/3, now there is the unauthorized host connected (Rogue3),set the allow MAC Address to be 0030.F295.15C6. If everything is correct, you will see ports Fa0/2 and Fa0/3 change status to down (err-disabled) when there is the attempt to connect from unauthorized hosts, and Host1 will not be able to connect with the unauthorized hosts (192.168.0.58 – 192.168.0.60) .